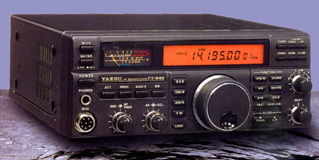 Here's a list of Yaesu accessories for the FT840. FM-747 FM board option; allows narrow-band FM RX/TX. TXCO-4 <+/-2 ppm high-stability oscillator. XF112A 6 kHz AM crystal filter. Most owners who have had difficulties with AM audio quality have reported that the 6 kHz option AM filter (p/n XF112A) is an absolute necessity for both transmitting in AM. It also makes the FT840 an excellent SWL receiver. Use of a AM modulation meter can tell you the percent of modulation your AM signal is peaking at. Ideally, you're looking for 100% modulation; over 100% the signal get distorted, under 100%, the signal sounds weak. For more information on running AM in the ham bands, go to The AM Window, where there's info on frequencies, audio tips, and running modern solid-state rigs on AM. Want to make your radio do more than what it came with out of the box? Or are you running a transverter and want to get complete band coverage? This mod will reprogram the Yaesu FT840 ham rig to transmit from 1.8-30 mHz with NO GAPS. It doesn't require any desoldering, diode snipping or clipping, or even any rewiring (other than a temporary ground jump), and can be done by anyone with a basic knowledge of electronics. 1. Remove antenna from radio and disconnect power supply. 2. Remove top and bottom covers. 8. Press and hold the memory (DOWN) + (UP) buttons and turn radio ON. 9. Turn the radio OFF. 10. Remove the jumper to ground on TP-2003. 12. Reconnect antenna and power supply. TP-2003 is a small pin next to the round backup battery. You have to remove both the top and bottom covers, even though the pin itself is on the bottom side of the chassis. Remove the top cover first; it locks itself into the bottom cover. You don't need to disconnect the speaker leads going into the top-mounted speaker. Remember to use large diameter zip cord when using the FT840; total current draw at 100 watts SSB can exceed 20 amps. Use of a ferrite RF line choke (Radio Shack, RS 900-7042) will reduce power hum from a dirty power supply. Several owners of the early FT840 experienced a complete lockup of the LCD and CPU that required a full reset of the microprocessor, but that problem seems to have been fixed in the later models. Here are some other radio mods pages that I've found. If you can't find what you're looking for here, chances are that one of these guys will have it. mods.dk - Probably the largest and most comprehensive mod site out there, with tons of information on practically every model of amateur radio produced. ac6v.com - The most complete online ham radio web directory I've found. Links to pages covering practically everything. If you can't find it here, it probably doesn't exist. W2BLC.com - Contains links to many FAQs for various transceivers. Although it wasn't designed as a ground station rig for satellite operations, the FT840 can operate as an IF receiver for a VHF/UHF transverter, or a seperate receiver for Mode A (2 meters for the uplink, 10 meters for the downlink) if you already have a 2 meter rig for the uplink frequency. A 10 meter dipole will receive the downlink signals from LEO satellites such as the Russian Radio Sputnik series very well. Go to AMSAT's web site for more information about satellites, frequencies, times, modes, etc. Example: 9D051234 = 1999, February (second month, or "D"), Production Run 05, unit #1234 in this run. By snail mail: Yaesu U.S.A., 17210 Edwards Rd., Cerritos, CA 90703, U.S.A.